It's almost like it never went away! The 2019 F1 season is back, and is already providing pundits with plenty of column inches after only the first race. There's a lot of motor racing to go, of course, and with this guide you can get an F1 live stream of every race. After an exciting Formula 1 season last time around where Lewis Hamilton came out on top with the World Drivers' Championship title and his team Mercedes nabbed the World Constructors' Champion title, it's going to be tough to top. Yet Hamilton has already said that's exactly what he plans to do for 2019. The fourth Grand Prix of the 2019 Formula 1 season is in Azerbaijan. The Azerbaijan Grand Prix is set to take place between April 26-28 at the Baku City Circuit. The 2019 F1 season has already featured the 1000th World Championship race in history, which will take place in China. But the excitement goes far beyond mere marks of measure, with another m-word set to tear up the tarmac – Mercedes. So what will be standing in the way of Hamilton romping home with the 2019 Formula One title? He's got plenty to go up against. Ferrari's Sebastian Vettel finished 2018 as runner-up at 88 points behind Hamilton. This season you can expect the four-time world champion to come out fighting as he is defending his reputation after Hamilton convincingly defeated him. Vettel is also under pressure as his new teammate and rising star Charles Leclerc replaces Kimi Raikkonen (who finished third overall in 2018) at Ferrari. Raikkonen joins Alfa Romeo Racing–Ferrari for this year. And this season sees McLaren changing from Honda to Renault as engine supplier after too many reliability issues. You can stream F1 live from anywhere in the world using this guide – read on to find out how. If you're resident in the UK, US, Canada, Australia or New Zealand, you can scroll a bit further down this guide to see who's showing the Formula 1 in your country. But if you're on holiday or away with work this year you can still catch the races – a good option to help you keep up with all the action live is to use a VPN service. By using this, your device appears to be connected from another country, allowing you to access that service for a live stream of all the races as if you were sat back at home. This year there is next-to-no free coverage of the F1 as Sky has nabbed the rights, meaning you'll be able to see it all via the Sky Sports F1 channel. This can be added on for £10 per month (for a limited time) or viewed as part of a Sky Sports package at £23 per month. Watch on the move using the Sky Go app too. Only the British Grand Prix race will be free to air on Channel 4 this year. Another option for non-Sky subscribers is a NOW TV Season Pass which lets you watch the F1 for the full season at a one off charge of £195 (aka about a fiver a week) if you sign up before the end of March. Otherwise it's £8.99 per day if it's just the odd race you're interested in. For access anywhere outside the UK you'll need to download a VPN service and relocate your IP to the UK. How to do that is laid out clearly above. For the 2019 F1 season it's ESPN that will be providing the broadcast. Cord cutters are in luck as you don't have to use cable to access ESPN but could use a free trial of a service like Sling or Fubo to watch it over an internet connection. If you're heading outside of the States then you can still access the feed if you use a VPN and register as being in a North American location that is showing the race. In Canada the 2019 F1 will be aired by RDS and TSN. For a chance to watch it online you can try services like Sling or Fubo which have free trials. 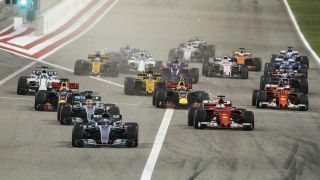 Paid-for service Fox Sports is showing every race of the 2019 Formula One season (except for the Australian Grand Prix that was aired by One (Network Ten)). But Australians can also live stream F1 action via the Kayo Sports streaming service, which features no lock-in contracts and also includes access to over 50 sports, both live and on demand. The Foxtel Now and Kayo Sports apps means you can access this from your chosen device wherever you are (although you'll need a VPN if you're taking that abroad). New Zealand will get the 2019 F1 races broadcast by Sky Sports meaning, yup, you'll have to pay for access. But fret not, there are ways of getting some cheap access.